Slovenia, Austria and especially Hungary are lagging behind most developed economies in innovation and economic results. One of the important obstacles is the educational system which has not yet adapted to the needs of the modern society. Creativity, innovation and entrepreneurship (CI&E) are crucial competences that cannot be taught in a simple manner. The project aim is to trigger different way of thinking in primary schools and to show that creativity, innovation and entrepreneurship is crucial for success - anywhere; in all subjects, in daily situations in school, in real life challenges, and to teach participants how to do that in practice. Teachers Katrin Finker, Thomas Leiter, Teresa Pichler and Katharina Rieder developed a project which aims to optimise concentration levels of students in class. The product is a tool for teachers which enables them to enhance the students' ability to concentrate. As a consequence, teachers can increase the efficiency of their teaching and students are supported to benefit more from the input provided. This project’s aim was to set up a Facebook page for the newly developed WIN branch of Schulschwestern High School. WIN is an acronym which stands for Wirtschaftskompetenz (economic competence), Innovation (innovation) Nachhaltigkeit (sustainability). The teachers involved in this project are Liselotte Aschbacher, Carina Dohr, Jagoda Markovic and Theresia Rajsek. Our mission is to increase students' reading motivation by designing and implementing a stimulating reading environment in cooperation with the local community, which will result in increasing joy of reading and will thereby strengthen literacy. The main goal of the project is to improve the school garden with some innovative solutions: portable beds for vegetables, herbs and flowers, a gutter with plastic bottles for collecting rainwater, benches made out of palletes etc. The project has evolved to solve the following problems: long queues, etiquette , students' attitude and consequetnly the noise in the dining hall/ cafeteria. The aim is to change the cafeteria into a place with less noise and a cozy atmosphere where students can socialize and enjoy the food. The main goal of the project is to change the way the students are spending their breaks. At the moment students and teachers are not satisfied and both want to change it. The product is new/better organisation of school breaks so students could spend it on school playground or take part in different relaxing activities in niches on school corridors (reading corners, School DJ/school radio...). The learning path offers an alternative and innovative learning experience, during which the participants get to know the capital city of Slovenia (sights, history, important people, etc. ), while interacting with the citizens as well as business owners and various typical Slovenian products. There is also great emphasis on promoting independance, creativity and fun. The idea of the project is to bring closer school and families. To confirm the relationship between students, teachers and parents they decided to organise a project day. Because of our busy days we haven’t got enough time to have fun together. Not only students but parents are overworked, tired and have low motivation. To break away from our daily routines our colleagues want to organise a project day where students, teachers and parents can work together, can exchange information, can ask for help if they need etc. In the school yard and in the classrooms we will set up stalls and show different professions, (such as beekeepers, dairy product makers, firefighters, bakeries, hairdressers, tailors). Full day competition (knowledge of the city, skill tasks at several stations of the town), ending a common picnic and party. In the classroom day-care students were surfing the Star Walk 2 application on the tablets and Star Walk Kids 2 on the phones and gathered the name and images of the constellations, stars, planet, which are more important in helping the orientation of the sky. Minor projects are aimed at reducing noise levels in the school during brakes. Students are being offered various activities to focus their attention and energy into positive actions that will not only help reduce noise in the school, but also promote various educational goals, such as healthy diet, reading, etc. The idea of the project is to encourage students to read more either in their mother tongue or in a foreign language and write their own stories. After selecting a short story, the students are given the title of each paragraph. They have to write their own stories chapter by chapter. Within this project a group of teachers (Eva Bauer, Marianne Landsmann, Edith Neugebauer, Monika Saqri) developed a prototype of a social room for teachers. This room is intended to facilitate communication, socializing and relaxation among teachers and could also be used for smaller (more informal) meetings and conferences. Classical National Holiday performance at the Cultural Center (for everyone), handicraft activities at 4 locations historical games from that era at 1 location, singing and song learning at 1 location The pupils should solve tasks related to the topic, that were prepared with an ICT application at 1 location. Finally they visit of hussers from Boldog village at the end of the day. The project team has developed the project since september 2017. 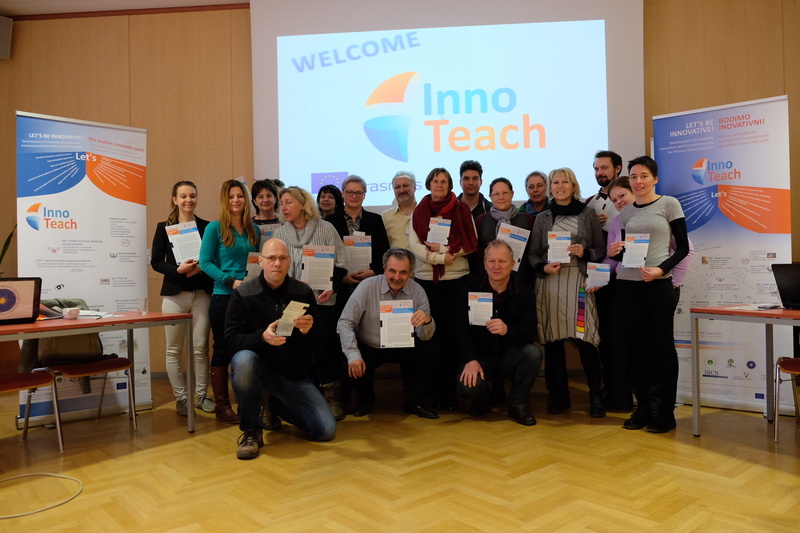 The team of teachers developed the project at the same time when the e-Traning took place. They used the newly gained knowledge about project management, problem and project based learning, prototyping in the concrete innovative project.